Actress Megan Fox sits down with Kathie Lee and Hoda to discuss her biggest passions: archeology and anthropology. She executive produces and hosts the new Travel Channel series, “Legends of the Lost with Megan Fox,” in which she explores ancient mysteries. The “Teenage Mutant Ninja Turtles” star, Megan Fox powers through our rapid-fire Q&A. Check out some new interview videos of Megan Fox on Conan Show! Love the show! When Megan Fox was 2, she told her mom she was going to be an actress. Not that she wanted to be an actress, but that she was going to be one. As a girl growing up in Tennessee, Fox was raised a Pentecostal Christian, speaking in tongues and falling down on the floor. She’s no longer a member of the church, but her upbringing opened her eyes to the spiritual world. Fox is here in an otherwise barren conference room to talk about her new film “Teenage Mutant Ninja Turtles: Out of the Shadows” which opened on Friday. She’s had bronchitis for two weeks. (“I’ll shake your hand, but you’re just going to get sick,” she warns.) She’s pregnant, though you can barely tell with the flowy lace dress she has on. 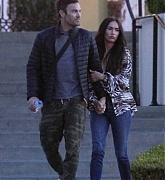 The actress, 30, is about to have her third child with former “90210” star Brian Austin Green, whom she married when she was 24. Their relationship is complicated: Fox filed for divorce last fall, but now that she’s pregnant with his child, the tabloids say they’re considering getting back together. In “Ninja Turtles” Fox once again plays broadcaster April O’Neil. The movie is a sequel to 2014’s live-action reboot, which grossed nearly $500 million worldwide. And nine weeks after she gives birth to her third baby, she’ll return to Fox’s sitcom “New Girl,” on which her arc this season as Zooey Deschanel’s deadpan roommate earned her strong critical reviews. “Extra’s” Renee Bargh caught up with Megan Fox on the set of “New Girl,” where she is filling in for new mom Zooey Deschanel. It was her first interview since her surprise split from Brian Austin Green in August. Megan will appear on “New Girl” early next year. As promised, here are some videos from September 9th which Megan and Will have an interview for the promotion of TMNT. After all the interviews and press junkets, Megan must’ve been really exhausted and misses her children back in the states. Hopefully she will spend more time with her sons after this. Megan has another interview with SMH. You can check out the interview from their website. Enjoy these interviews of Megan! Love her quotes! Below is an short clip of Megan Fox introducing herself and TMNT movie to all the Korean fans. She even said ‘I Love You’ in Korean to all the viewers. So sweet of her!